John Young Rediscovered the Australian Night Parrot, but Did He Lie About His Later Findings? – Animal Lovers Unite! There is no doubt that John Young rediscovered Australia’s Night Parrot in 2013. But the naturalist may have fabricated just about everything he reported about new populations and nesting sites of the birds over the past two years. The panel, led by ecologist Peter Menkhorst of the Arthur Rylah Institute for Environmental Research in Melbourne, recommended that all of Young’s Night Parrot work with the AWC be retracted, effectively reducing the number of known populations of the critically endangered Night Parrots to three from five. For many in the Australian birding community, it feels like deja vu. Young, whom I profiled for Audubon last year, is an expert bushman and avian photographer who has previously been accused of manipulating bird photos and making dubious claims dating to the 1970s. In 2013, when he took the first photographs of a living Night Parrot on a remote cattle station in Queensland, it was hailed as the conservation find of the century and offered a chance for redemption for Young. Fleming resigned in July 2018, Young resigned in late September, and the panel began working in November to investigate his research at AWC sites. Before any of that happened, Young was bringing in publicity for the organization. Within months of joining the AWC, he claimed to have found nests and eggs at Diamantina National Park, which led the government to close that area to visitors and the AWC to issue a call for donations “to help save the Night Parrot.” “Largest-known night parrot population found in Queensland,” blasted an article in Australian Geographic. The eggs in one nest, however, look like they are made of plaster or clay, according to experts who examined Young’s photographs as part of the investigation. Two other nests had eggs that were likely from a small parrot. The nests themselves were also questionable. One nest consisted of a bedding of vegetation that included the leaf-life structures from Acacia plants. Other researchers have found that Night Parrots lay their eggs directly on the ground inside large spinifex bushes; the only vegetation present in those cases are the bits of spinifex that the birds have nibbled on. 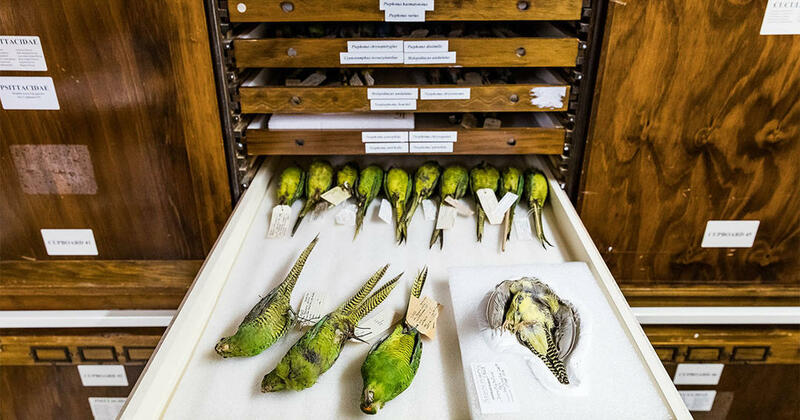 Young’s most eyebrow-raising recent “discovery” was the Night Parrot feather he plucked from a Zebra Finch nest at the AWC’s Kalamurina Sanctuary in 2017, which provided evidence that the bird still existed in South Australia. Menkhorst says the panel found it suspicious that the feather Young deposited at the Southern Australian Museum turned out to be different than the one he had originally photographed in the nest. The following year, Young came back from Kalamurina triumphant with a recording of a Night Parrot call, and the AWC touted it as being “independently verified.” Young’s own notes, however, showed that he had actually played back publicly available recordings of a Western Australian Night Parrot near his own song recorders that same night, Menkhorst says. “We can’t say one way or another that it was intentional,” he says. Enough doubts have been raised about Young’s credibility that the AWC has also retracted his records related to the endangered Buff-breasted Button-quail, though Menkhorst’s panel did not review that evidence. Young had claimed to have taken blurry photographs of the birds last year—the first ever for the rarely seen species—and identified them at an AWC reserve more than two dozen times, according to the winter 2018 issue of AWC’s magazine, Wildlife Matters. All material related to Young’s research has now been scrubbed from AWC’s website, effectively erasing the information from the public record. The panel’s full report will not be released to protect individuals who provided testimony. The AWC has followed the panel’s recommendation of adopting new protocols for studies of rare birds, including requiring GPS data on photographs and having better playback procedures. Night Parrot researcher Nick Leseberg of the University of Queensland, whose primary field site is the Pullen Pullen Night Parrot Reserve, continues to listen for new birds in neighboring Diamantina and other likely locales in Queensland. He will also be analyzing AWC's recordings. Young did not agree with the panel’s findings but was unwilling to comment on them. “Everybody can do what they want,” he says. He has since given up conservation work. “It’s not worth it," he says. Despite the evidence against him, he continues to have unlikely supporters, including Greg Roberts, a birder and journalist whose own reporting has probed Young’s claims. “It's unfortunate in my view that the AWC has thrown the baby out with the bathwater by dismissing all of his field work data,” he says.